Sammy Nettling looks for a pitch to hit. The senior catcher drove in 5 runs in Northwestern’s Big Ten Tournament run. 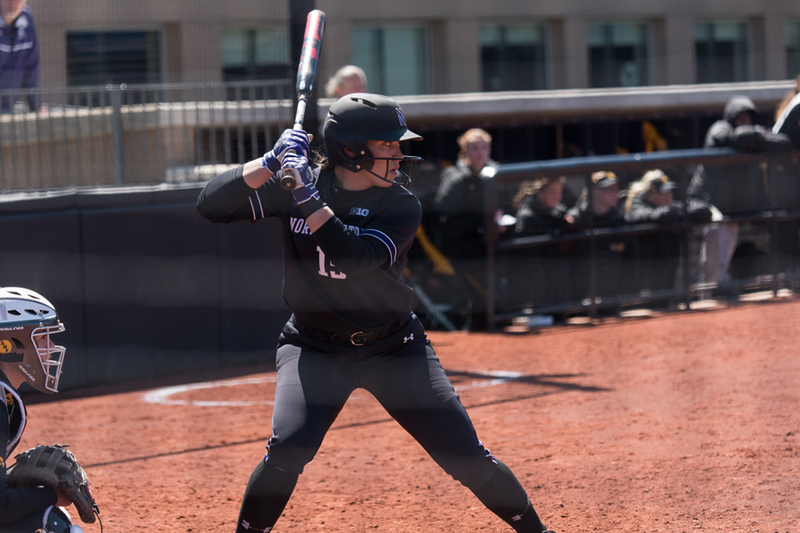 With the weather forcing Northwestern into playing three games in two days at the Big Ten Tournament this weekend, the Wildcats nearly pulled off a title. As it was, NU (36-17, 14-8 Big Ten) made an inspiring run in Madison, Wisconsin, beating Iowa (21-32, 6-16) and Michigan State (26-26, 10-11) on Saturday before falling in the championship game to Minnesota (39-15, 17-4) on Sunday morning. In a quarterfinal that was pushed back to Saturday morning due to rain, freshman Kenna Wilkey found herself in a pitchers’ duel with Iowa ace Allison Doocy. Wilkey got touched for a run in the first inning but gave up just two hits the rest of the game. The Cats tied it in the second on a run-scoring single from sophomore pitcher Morgan Newport, and the score stayed 1-1 through the seventh. NU put together a game-winning rally in the eighth against a pitcher who had shut out the Cats just about two weeks earlier. Junior first baseman Lily Novak led off with a single and moved to second when senior center fielder Sabrina Rabin was hit by a pitch. Freshman second baseman Rachel Lewis blasted a line drive over the left fielder’s head, and Novak came in to score the winning run. Newport threw a no-hitter in the semifinals on Saturday evening against Michigan State, as NU won 11-0 in a game that was shortened to five innings due to the run rule. She walked just one batter and recorded nine of her 15 outs on the ground. It was just the second no-hitter in Big Ten Tournament history. Newport had plenty of support from her offense. Every player in the batting order had at least one hit, with Rabin leading the way with a three-hit game. Senior catcher Sammy Nettling drove in 4 runs, and senior right fielder Brooke Marquez hit a 3-run double to cap an 8-run second inning. A tired Cats team took the field Sunday morning against Minnesota, and NU fell behind 6-0 in the second inning. The Cats battled back several times but could not contain the Golden Gophers’ offense. Lewis tallied three hits, Nettling was 2-for-2 and Wilkey had three RBIs, but NU ultimately suffered a 9-6 defeat. This was the first time the Cats made the Big Ten title game since 2008, and their 36 wins are also their most since that season. NU will play in the Athens, Georgia, regional of the NCAA Tournament next weekend — starting with a first-round game against Cal — after officially receiving an at-large tournament bid Sunday night.